Galaxy 1068 can be seen in close-up in this view from NASA's Hubble Space Telescope. NuSTAR's high-energy X-rays eyes were able to obtain the best view yet into the hidden lair of the galaxy's central, supermassive black hole. This active black hole -- shown as an illustration in the zoomed-in inset -- is one of the most obscured known, meaning that it is surrounded by extremely thick clouds of gas and dust. t this is true for even the thickest of donuts. Until recently, telescopes weren't able to penetrate some of these doughnuts, also known as tori. "Originally, we thought that some black holes were hidden behind walls or screens of material that could not be seen through," said Andrea Marinucci of the Roma Tre University in Italy, lead author of a new Monthly Notices of the Royal Astronomical Society study describing results from NASA's Nuclear Spectroscopic Telescope Array, or NuSTAR, and the European Space Agency's XMM-Newton space observatory. With its X-ray vision, NuSTAR recently peered inside one of the densest of these doughnuts known to surround a supermassive black hole. This black hole lies at the center of a well-studied spiral galaxy called NGC 1068, located 47 million light-years away in the Cetus constellation. The observations revealed a clumpy, cosmic doughnut. "The rotating material is not a simple, rounded doughnut as originally thought, but clumpy," said Marinucci. Doughnut-shaped disks of gas and dust around supermassive black holes were first proposed in the mid-1980s to explain why some black holes are hidden behind gas and dust, while others are not. The idea is that the orientation of the doughnut relative to Earth affects the way we perceive a black hole and its intense radiation. If the doughnut is viewed edge-on, the black hole is blocked. If the doughnut is viewed face-on, the black hole and its surrounding, blazing materials can be detected. This idea is referred to as the unified model because it neatly joins together the different black hole types, based solely upon orientation. In the past decade, astronomers have been finding hints that these doughnuts aren't as smoothly shaped as once thought. They are more like defective, lumpy doughnuts that a doughnut shop might throw away. The new discovery is the first time this clumpiness has been observed in an ultra-thick doughnut, and supports the idea that this phenomenon may be common. The research is important for understanding the growth and evolution of massive black holes and their host galaxies. "We don't fully understand why some supermassive black holes are so heavily obscured, or why the surrounding material is clumpy," said co-author Poshak Gandhi of the University of Southampton in the United Kingdom. "This is a subject of hot research." Both NuSTAR and XMM-Newton observed the supermassive black hole in NGC 1068 simultaneously on two occasions between 2014 to 2015. On one of those occasions, in August 2014, NuSTAR observed a spike in brightness. NuSTAR observes X-rays in a higher-energy range than XMM-Newton, and those high-energy X-rays can uniquely pierce thick clouds around the black hole. 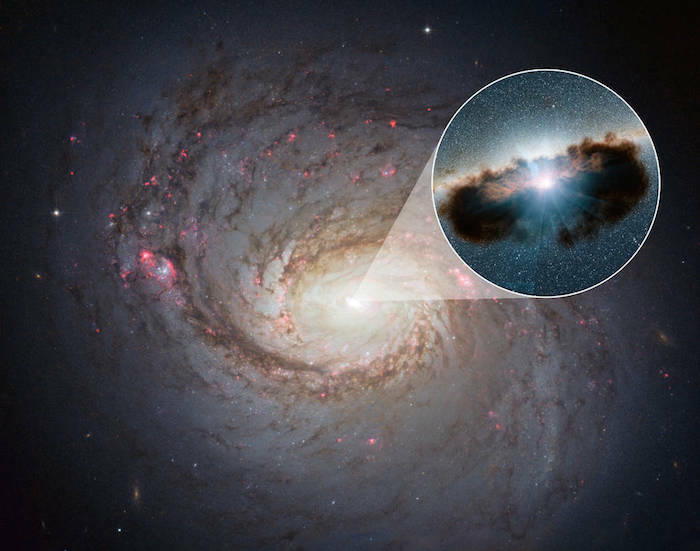 The scientists say the spike in high-energy X-rays was due to a clearing in the thickness of the material entombing the supermassive black hole. "It's like a cloudy day, when the clouds partially move away from the sun to let more light shine through," said Marinucci. NGC 1068 is well known to astronomers as the first black hole to give birth to the unification idea. “But it is only with NuSTAR that we now have a direct glimpse of its black hole through such clouds, albeit fleeting, allowing a better test of the unification concept," said Marinucci. The team says that future research will address the question of what causes the unevenness in doughnuts. The answer could come in many flavors. It's possible that a black hole generates turbulence as it chomps on nearby material. Or, the energy given off by young stars could stir up turbulence, which would then percolate outward through the doughnut. Another possibility is that the clumps may come from material falling onto the doughnut. As galaxies form, material migrates toward the center, where the density and gravity is greatest. The material tends to fall in clumps, almost like a falling stream of water condensing into droplets as it hits the ground. "These coordinated observations with NuSTAR and XMM-Newton show yet again the exciting science possible when these satellites work together," said Daniel Stern, NuSTAR project scientist at NASA's Jet Propulsion Laboratory in Pasadena, California. 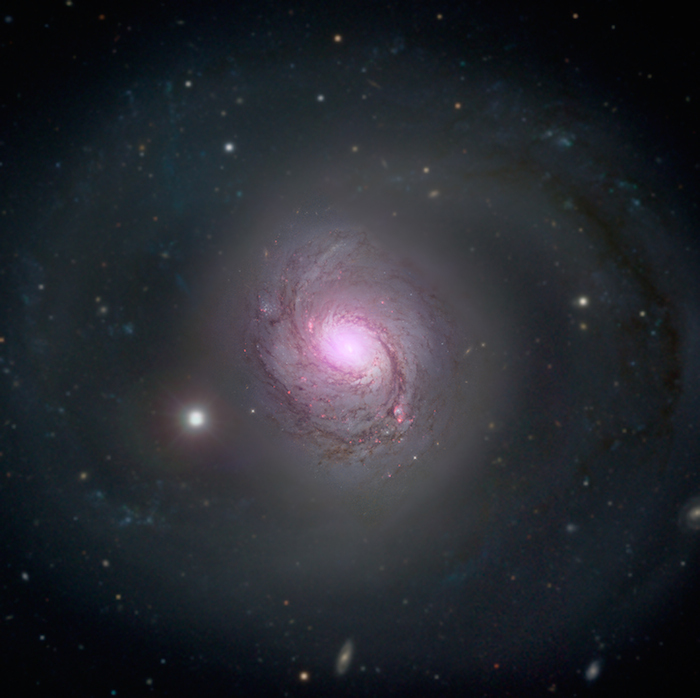 Galaxy 1068 is shown in visible light and X-rays in this composite image. High-energy X-rays (magenta) captured by NASA's Nuclear Spectroscopic Telescope Array, or NuSTAR, are overlaid on visible-light images from both NASA's Hubble Space Telescope and the Sloan Digital Sky Survey. The X-ray light is coming from an active supermassive black hole, also known as a quasar, in the center of the galaxy. This supermassive black hole has been extensively studied due to its relatively close proximity to our galaxy.